Details : LUCARIS, Asia’s first world-class luxury crystal wineware, is proud to be the official wine glass sponsor of Wine & Dine Festival 2017, Thailand’s first wine & dine event at Emquatier, G Floor on 19th – 22nd January 2017. The event brought together the world-class cuisines and beverages. There were a number of booths from leading brands of wine & food including LUCARIS Asia’s first luxury crystal wineware brand. Aside from the trade show, LUCARIS hosted an activity on-stage introducing the latest wine glass collection ‘Desire’. Desire was co-created and co-designed between LUCARIS and Hong Kong Sommelier Association (Greater China) led by the President of the Association, Mr. Nelson Chow. Desire Collection elevated the wine drinking experience, in turn giving the wine a new dimension to its character with ‘Aerlumer’, the signature of wine glass innovation. 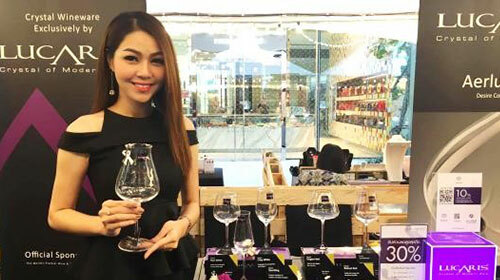 LUCARIS gave away the prize of DESIRE Tasting Set valued 2,650 THB to wine lovers who won the mini quiz activity on stage. LUCARIS also sponsored the DESIRE Universal wine glass for every wine lover who joined the tasting event. LUCARIS is available in all leading department stores and online stores throughout Asia.